Nineteen years ago I crawled between the sheets of my girlhood bed for the last time just shy of midnight. I woke to a winter wonderland, the sun glaring off the soft dusting of snow. The world was shiny and white on my wedding morn. It was cold too - the end of the coldest week of that year. My sister and I got ready together for the last time in mom's bathroom. We giggled and snorted over the placement of the stick-on bra I was wearing. We left the house for the church at the appointed hour, carrying our dresses. The things that mattered to me nineteen years ago are different than what matters to me now. It mattered then that everything I did was perfect. It mattered then that everything happened according to my planned shedule. It mattered then that everyone followed my rules. Today what matters is different. What matters is that I love and am loved. It's that simple. Would that I had known that then. Tomorrow morning I plan to mail our annual holiday letter in honor of nineteenth year of marriage. I didn't have the time or inclination to write the letter yet. Writing only happens for me when the time is right. It will be right in the early hours of the morning. I can feel it. The words are spinning in my head, waiting to land in the proper places. I can't wait to read the story of 2009. 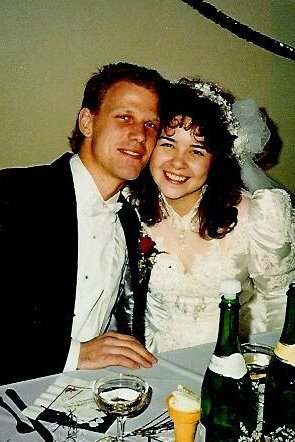 And HURRAY for Joe and I. I'm so glad we've had nineteen years, even though I can't believe it's been nineteen years. I have to keep saying it to make it feel real. I still feel my heart lighten when I see him. I still feel wonder that we belong to each other. I still marvel that God made him for me.